Researchers grading and sorting common carp at the Chinese Academy of Fisheries Science.The water was at 8°C and all staff including informaticians, lab scientists and admin staff were wading waist deep for most of the working day! Andy Cossins is Professor of Animal Genomic Sciences at the University’s Institute of Integrative Biology. “Harbin is a city of 5 million people in the northeast of China, having grown in the last 100 years from a population of just a few thousand mainly white Russian emigres. It is perhaps best known for its ice sculpture displays during the bitterly cold winters, but its explosive economic development marks this out as a major centre of economic activity. I was invited by the Chinese Academy of Fisheries Science to visit their Harbin branch to explore closer collaborative links in aquaculture research. 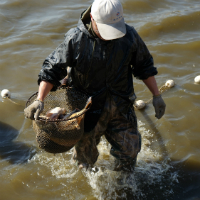 Their scientists have made great strides recently in decoding the genomes of freshwater fish used in Chinese aquaculture. China dominates the production worldwide with a focus on several species of carp that together comprise over 14 million tonnes annually, worth several billion US$, and which contribute much to the Chinese diet. Their new genome data are critically important in directing breeding programmes to generate better growth properties, reduced bones in the muscle (to avoid hurting the throat! ), and improved resistance to some serious viral and bacterial diseases. These species are amazingly hardy in surviving extreme winter cold and a more frequent lack of dissolved oxygen, the underpinning genomic mechanisms of which have occupied our attention in Liverpool for the past 15 years. So we agreed a programme of collaborations to leverage their genome data to help identify novel genes responsible for resisting extreme cold and hypoxia, some of which would likely be conserved in humans. My visit also included a day at their research fish farm on the outskirts of the city. This showed me the massive scale of their breeding programmes, but also the frightening march of 30-story skyscrapers as the city grows outwards into the surrounding farmland. 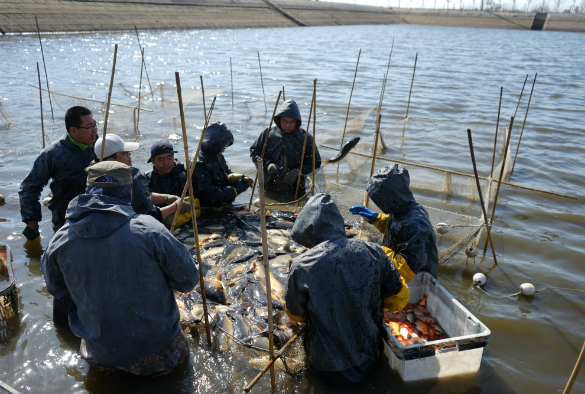 The photo shows the researchers grading and sorting common carp in one of their many large concrete ponds. Other ponds contained other types of carp and also a Chinese species of sturgeon, and at lunch we saw all of these types of fish again but this time on a plate! 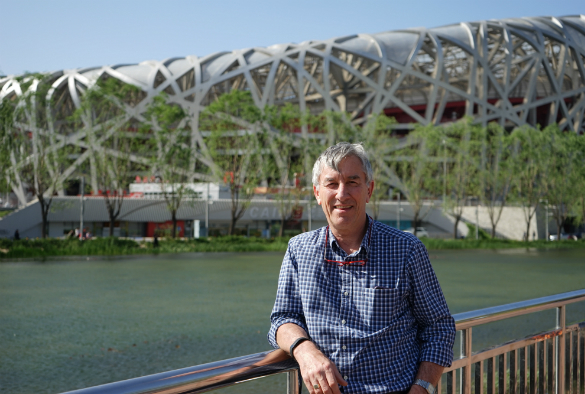 Outside the Beijing National Stadium, also known as the Bird’s Nest.